Warning: This review contains spoilers for the third season of The Last Kingdom. 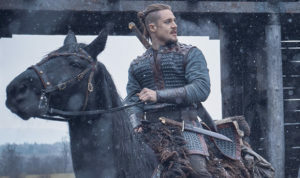 The third season of The Last Kingdom continues the saga of the warrior Uhtred of Bebbanburg and his complicated relationship with King Alfred the Great. The ten episodes adapt the fifth and sixth novels in Bernard Cornwell’s Saxon Stories, The Burning Land and Death of Kings, which explore the last days of Alfred’s reign, the growing unrest in the different kingdoms, and the continuing struggle with the invading Danes. Uhtred and Alfred are the main focus of the show, as well as all the people who surround them, whether friend or foe. Uhtred is a man torn between two worlds, born a Saxon but raised as a Dane, then bound by an oath to serve Alfred, a man very unlike him in temperament and habits, but nevertheless a man he comes to reluctantly admire. Young and reckless, Uhtred is nevertheless a capable warrior, never lacking in courage, and cunning when it comes to battle strategy. He is loyal to his friends but is forced to choose sides several times in the season, choices that take their toll on him. He is passionate and easy to anger but also has a wicked sense of humor so as much as the people around him (Father Beocca and Hild) get frustrated by his recklessness, they still can’t help but love and protect him. He also endures a fair share of tragedy this season, every loss leaving making him more serious and mature. He believes his misfortune to be caused by a curse from the witch Skade. For such a fierce warrior, he isn’t afraid to show vulnerability and each time he loses someone dear to him this season, you can see the sorrow in his eyes. Alfred is pious and pragmatic, possessed of a sharp intellect that more than makes up for his lack of physical prowess. The third season shows the decline of his health as the man appears almost like a wraith for most of the season, but where his body fails him, his mind compensates. He views his kingship as a duty to unite the disparate kingdoms under Wessex and eventually, he dreams of England. He builds alliances with Mercia, East Anglia, and Northumbria and he is practical enough to recognize that he needs men like Uhtred to effectively defend his kingdom against the threat of the Danes. He can be a harsh master (the punishment for treason he implements this season comes to mind) but he struggles to be just. He is determined to leave a legacy and to chronicle his achievements for future generations. 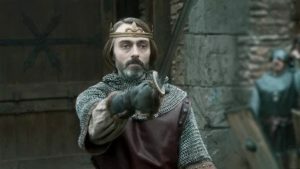 The complex and sometimes antagonistic relationship between Uhtred and Alfred drives The Last Kingdom, also as a representation of the main theme of paganism clashing with Christianity. Uhtred continues to worship the old gods of the Danes and is harshly critical of Alfred’s religion, while Alfred and many of the members of his court disapprove of Uhtred’s heathen ways. But for the most part, their relationship works and Uhtred has kept his oath of destroying Alfred’s enemies and protecting his realm. 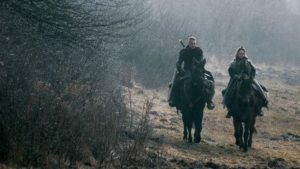 An unfortunate event early in the season forces Alfred to banish Uhtred, who, feeling freed from the shackles of his oath and reeling from the death of his wife, Gisela, flees to Dunholm, where his brother Ragnar reigns after the events of the second season. For a time, he allies himself with the Danes, as they plot to invade Wessex after Alfred’s death. They know that the king is at death’s door and they want to take advantage of the power vacuum that will emerge after Alfred dies. 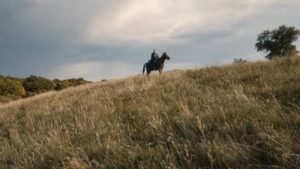 But as the series progresses, fate pushes Uhtred back on the path towards England, because of the oath he made to Alfred’s daughter, Aethelflaed, and he chooses to turn his back on his beloved Danish family to save Aethelflaed’s life. Later on, he also learns to support the Aetheling Edward, the prince meant to be king, whose life he had helped save in the first season. Uhtred and Alfred’s eventual confrontation and reconciliation is a highlight of the season, both men admitting their reluctant mutual admiration as well as how much they owe to the other. It’s a rare moment for two characters, who are always concerned about reputation and appearances to be completely honest with each other, and it was beautifully portrayed by Alexander Dreymon and David Dawson. Alfred pardons Uhtred and the latter swears to support Edward after Alfred’s death, but this time the oath is not forced out of him. They part on good terms, just as the series draws to a close. Alfred’s death and the reaction of all those close to him is another powerful moment in the season, giving credit to how significant of a role he has played in the lives of his people and his enemies. This was also a pivotal event that drives the final battle with the Danes and sets the tone for the future of The Last Kingdom. The audience have formed a bond with The Last Kingdom characters, having watched their journey for the last couple of seasons. The Last Kingdom does not have a cast as extensive as that of Game of Thrones so it is fairly easy to keep track of the main players. Uhtred has his family in Father Beocca and Thyra, Ragnar and Brida, Abbess Hild, and his friends are his closest companions (and the show’s main source of comic relief amidst the bloodshed and drama), Finan, Sihtric, and Osferth. We spend quite a bit of time with Beocca as he painstakingly tries to keep Uhtred out of trouble. Antagonists abound both among the Saxons and the Danes. The main Danish threats this season are Haesten, Cnut, Sigurd Bloodhair, and the witch Skade. 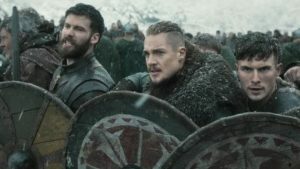 The pagan religion of the Danes gives the show its mystical and supernatural elements, from Skade’s curses to the ritual that Uhtred and Brida need to follow to allow Ragnar’s soul to ascend to Valhalla. The male Danish leaders are all driven by their lust for power and blood, as well as their obsession with Skade. 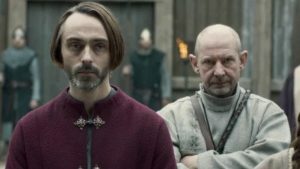 Aethelwold leads the villains on the Saxon side as he schemes to overthrow Alfred to claim what he believes is his birthright as the son of the previous king. He’s a pathetic, treacherous, dishonorable character who still manages to manipulate his way into court and even into the confidence of the Danes. I felt some pity for him when Alfred decided to punish his treachery, but his murder of Ragnar and his constant betrayal and cowardice left him with no real redeeming values. We saw less action from Aethelred this time though he was clearly vying to be king of Mercia and even plotted to murder his wife, or at least find a reason to divorce her. Luckily, his right-hand man Aldhelm is on Aethelflaed’s side, though he had to pay a price for his allegiance. One thing that I love about The Last Kingdom is the presence of fascinating and fully fleshed-out female characters. Admittedly, this is always I factor I consider when watching a show and this one does not disappoint. Granted, there are still more men than women in prominent roles and the series could probably do with more diversity, but the ladies we do get are all wonderful. They have strengths and flaws, complex motivations, and noble acts. And they are evenly matched with any male character, most of them consistently calling out Uhtred on his questionable choices. Among the Saxons, the most important is Aethelflaed, who has established herself as the warrior queen of Mercia, loved by the people and able to lead her men into battle. After her ordeals in the second season, she has moved away from the shadow of her scheming husband Aethelred, and has found a great ally in Uhtred. Her mother Aelswith is another fascinating woman, though she is always in conflict with Uhtred. She is a supportive wife to Alfred, who listens to her counsel and consults her on kingly matters. She is also a protective mother to Edward and a lady determined to uphold Alfred’s legacy. 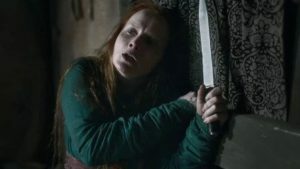 We don’t see much of Abbess Hild this season, but she does manage to steal the show whenever she’s around, reproving Uhtred and inspiring fear in Finan and the other men. She also shows great compassion and kindness for the warrior during his lowest moments and is one of the few people who stays by his side even when he is declared an outlaw. Both Brida and Skade are also driven by ambition but while Brida prefers to do it the old-fashioned way, through bravery and battle, Skade prefers to seduce the strongest warrior she meets and stay by their side. Both women are capable fighters who can strike fear and inspire admiration in even the fiercest Danish lords. 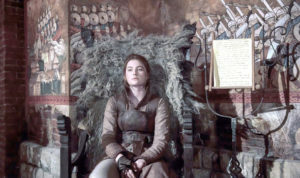 Brida continues to be a fearsome but sympathetic character, her history with Uhtred showing a bond that they can never break, no matter which side they are on. After Ragnar’s death, they both embark on a journey to ensure that his soul reaches Valhalla and when the deed is done, they share a tender moment together as they mourn the loss of their dear one. Thyra has her moments to shine this season, not just as Beocca’s wife or Ragnar’s sister but as a woman, like Uhtred, sharing two worlds and two cultures. This becomes a major plot point towards the end of the season and one I am not very pleased with, but I am glad that we got to see more of Thyra being happy, after all she suffered in the previous seasons. As with all cases of television adaptations, The Last Kingdom made some changes from the plot of the books, some more successful than others. Speaking as a book reader, I found that most of the changes worked to build a cohesive season. One did feel like the first five episodes constituted one book and the last five were another as was the case with the previous season. The writers of the show were able to weave a long over-arching story with the main elements from both novels. Two major changes from the books are the deaths of Ragnar and Thyra, and while the former serves to launch Brida and Uhtred on an important journey, the latter feels completely unnecessary. Even worse, it subscribes to that troublesome trope of fridging a female character so that a male character can get more development. Thyra did not deserve to die like that, and Father Beocca had more than enough development and screentime for him to have to suffer such a loss. Not to mention, Uhtred lost another family member because of a random racist. While I found Ragnar’s death at Aethelwold’s hand to be implausible (such an experienced warrior surely would not have been so slow to react), Thyra’s death is one of the few, major misfires in a season that was fairly cohesive and well-written. Do better next time, show. 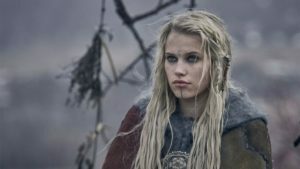 On the whole, The Last Kingdom season three was a welcome treat to long-time fans of the show and to those who enjoy a good historical drama. The performances were solid, and the cinematography was gorgeous. There was a good balance between frantic battle scenes (the shield walls continue to be impressive) and quieter moments that were no less powerful. Comparisons with other period and epic dramas are inevitable and two shows closest to The Last Kingdom are Game of Thrones and Vikings. In terms of the historical time period, the conflict between the kingdoms of England and the Danes, and the bloody battle scenes, the show is closer to Vikings, but it also shares a lot of the political intrigue, broad scope, and complex characters with Game of Thrones. 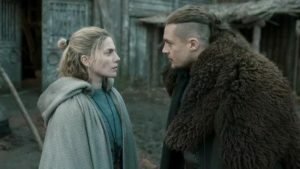 But The Last Kingdom also stands out because it has more structured story than Vikings, mostly due to its source material and because of the emphasis on Uhtred’s dual nature as a symbol for the evolution of a country’s identity and the need to find a balance between ancient traditions and modern sensibility. The series managed to conclude its major storylines while leaving room for more adventures. Alfred may be gone but Uhtred’s journey is far from over.